At the Silken Gran Hotel Domine Bilbao in Spain, art and design reflect the Spanish Guggenheim Museum everywhere. Befitting a hotel located opposite the famous museum, this is the Silken Hotel chains’ first five-star and they spared no expense getting it right—including fantastic sleek and deep soaking bathtubs designed by world famous Philippe Stark. When was the last time you took a soak in a designer tub? Discreetly shaded so you could enjoy the view of the Guggenheim across the street while sudsing? The Gran Hotel Domine Bilbao’s 21st century look and inspiration originated from artist Javier Mariscal—and starts outside. I wasn’t kidding: the Guggenheim is actually reflected in the hotel ‘s mirror-like façade. Checking in at the front desk felt more like I was entering a modern art museum: with a glass-topped atrium that rises to the hotels’ 6th floor and houses Mariscal’s ‘Fossil Cypress,’ a 26-meter high tower of mesh-encased stones. 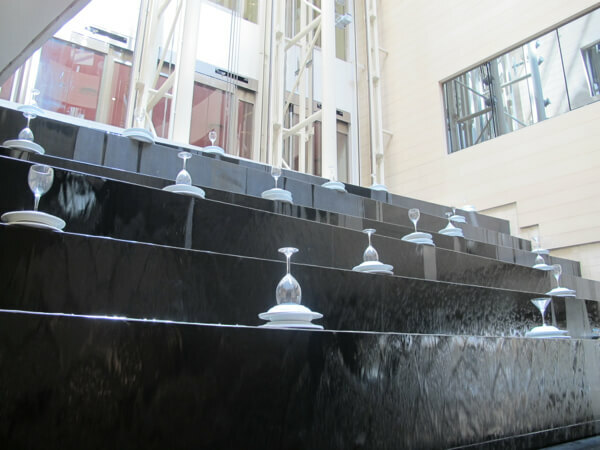 Opposite that a terraced wall of water cascades behind wine glasses stacked artistically on plates. Nearer the front desk is sculptural furniture like the lipstick red seating piece. A multilingual staff made check-in easy – and a valet whisked my suitcases up shortly after I took the atrium’s glass elevator to my room on the 5th floor. Make sure to take a look down the actual stairwell at some point though. It’s also designed like a piece of art—a three-dimensional swirl of black and white. 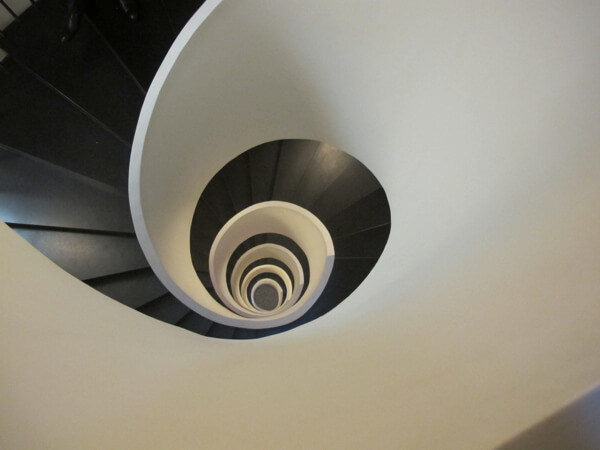 Each floor of the Gran Hotel Domine Bilbao is themed and colored differently. 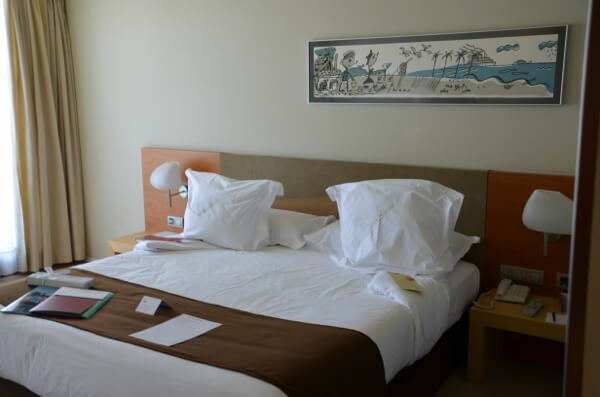 Likewise, the 135 air-conditioned rooms and 10 suites come in varying choices. Mine was considered a Guggenheim Club—which meant it was more spacious than the “Comfort” category, overlooked the Guggenheim, and had that Philippe Stark tub I loved (also a separate shower), plus Mariscal designed bath amenities, and robe. It also had a comfy armchair, desk, mini bar, music center with a selection of CDs and Satellite t.v. (although I’ll be honest, I never even turned the t.v. on the nights I was there). Wi-fi is complementary but was slower than I would have liked, but it worked. I heard others complaining at the front desk they couldn’t even get it. Other room categories include the Comfort Triple (for families who need an extra bed), Junior Suites, and 6th floor suites that include private terraces. Some rooms overlook the atrium, so be sure to specify you want a room with a view of the Guggenheim. It’s worth it. I loved my room #518. 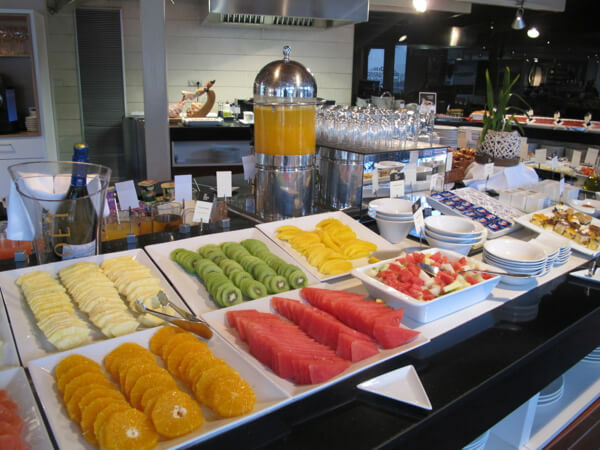 Breakfast is expensive and not included in the price of the room–but the lavish buffet spread (complete with bottles of bubbly) is laid out as beautiful as a painting and I would definitely recommend indulging in it at least once while you are staying here. It’s on the 6th floor in the Restaurant Doma (dinner is also served here—Spanish chef Martin Berasategui has seven Michelin stars, although I did not dine there). The outdoor terrace overlooks the Guggenheim, but inside the restaurant the wall of windows provides almost as fantastic a view. On the main floor of the Gran Hotel Domine Bilbao, there is a brasserie-type café—Le Café Metropol. Done in minimalist black and white with a marble floor, it seems in direct contrast to the colorful Splash & Crash lounge across the lobby. But it’s a good place if you’re hungry for a late afternoon nosh and a glass of the region’s Txakoli, a dry white wine. Its wall of windows looks out on the famous flower bedecked “Puppy” that is next to the Guggenheim. The Splash & Crash cocktail lounge looks like a place Austin Powers might be hanging out in—with 70s style black and white leather chairs, red-cushioned stools, Mariscal’s colorful Pop Art adorning the walls and a sparkling silver floor that was also designed to reflect the Guggenheim’s titanium exterior. 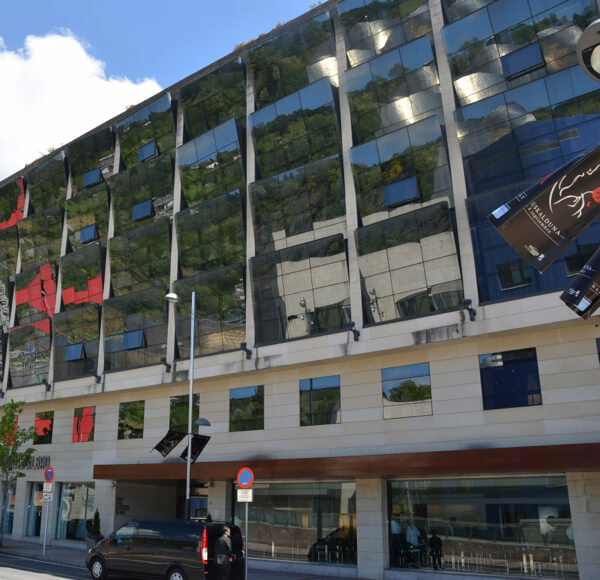 For more details and information, check the Gran Hotel Domine Bilbao website. You can also check rates online at Priceline or Hotels.com. Review and photos by Donna Tabbert Long who stayed at the hotel during a visit to the Basque country as a guest of the Spanish government. An avid traveler and food lover, Donna Tabbert Long is an award-winning freelance writer. She's the first to admit her siren songs on the road often lead her to sugar, Champagne, and bookstores. Finding bakeries, patisseries, and chocolate shops, along with a few cool spots for sipping some bubbles--and she knows she's arrived. Part of the pleasure during such searches includes discovering the best places to rest her weary body. Her articles have been featured in National Geographic Traveler magazine, the Minneapolis Star Tribune, Dallas Morning News and AAA Home & Away Magazine. When she's not traveling, she's at home in Minneapolis. Catch up with her on Twitter @tabbertlong.